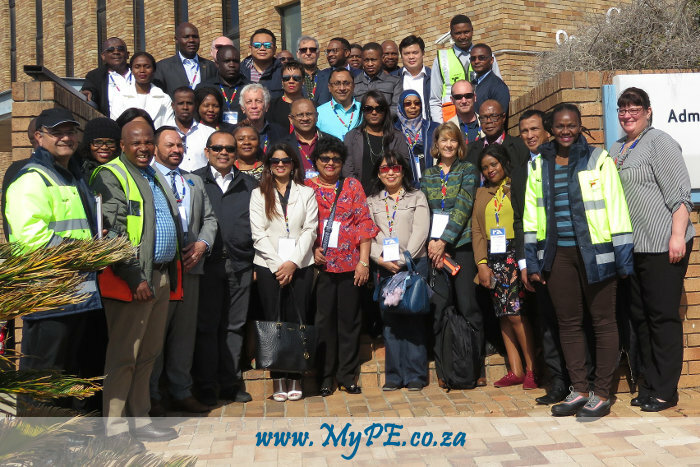 The IORA delegation with the Port of PE’s Sujit Bhagattjee and Xola Mkontwana on the far left and Philile Gamede second from the right, in front. Transnet National Ports Authority’s (TNPA) Port of Port Elizabeth hosted a 40-member delegation from the Indian Ocean Rim Association (IORA) Working Group on The Blue Economy (WGBE) on 12 September, led by Head: Oceans Economy Secretariat from the Department of Environmental Affairs, André Share. The visit formed part of the 1st Preparatory Meeting for the Establishment of the IORA Working Group on the Blue Economy (WGBE) which was hosted by the Department of Environmental Affairs in conjunction with IORA from 12 to 13 September 2018 in Port Elizabeth. During the port visit TNPA showcased various Operation Phakisa: Oceans Economy initiatives that are being implemented. Port Manager, Rajesh Dana said the Authority welcomed opportunities to showcase Operation Phakisa initiatives, as TNPA is a lead implementing agent of this government initiative to unlock the economic potential of the Oceans Economy. The group’s bus tour included the viewing of aquaculture initiatives at the port’s North Sea Wall where approximately 66 hectares of sea water is available for aquaculture leases. There is also land available to complement establishing fishing type hatcheries. TNPA has already concluded a 10-year lease with a tenant for oyster farming covering 27.5 hectares of sea water. The delegation also visited the port’s tug jetty to view the new tugs MVEZO and QUNU which were built in South Africa. The tugs were delivered as part of TNPA’s R1.4 billion, nine-tug contract to procure new and powerful vessels with a 70-ton bollard capacity to cater for the larger commercial ships now increasingly calling at South Africa’s ports. A highlight of the visit was the stopover at the port’s slipway precinct where over R200 million was invested into new vessel repair facilities including replacement of the 130-year-old, 1 200-ton lead-in jetties, the upgrade of the 40-ton slipway and introduction of a new 90-ton boat hoist. This infrastructure is helping to stimulate the boat building and boat repair industry in the Eastern Cape. Other areas of interest within the port’s marine engineering hub include Workshop 17, and land earmarked for boat building and a proposed site for a composite hub for yacht building. Also on the itinerary was a site visit to the new plough tug which is being built for TNPA by local shipbuilder Tide Marine Shipyard from premises within the port. The vessel is the first of its kind to be constructed for TNPA in South Africa and will be used as a bed leveller to smooth out high spots created by marine traffic in high-volume berth areas. It is expected to be handed over to TNPA Dredging Services by October 2018. Delegates also visited the PE Waterfront project site and TNPA representatives shared with them how this catalytic project would change the physical and economic face of Nelson Mandela Bay. TNPA Port Elizabeth representatives hosting the delegation were New Business Development Manager Sujit Bhagattjee, Business Strategy Manager Xola Mkontwana and Acting Property Manager Philile Gamede. IORA consists of 21 Member States globally and South Africa is the current Chair of IORA and the Working Group on the Blue Economy. Previous: Are we pushing our workers too far?